It’s great to reach a clean signal from FM stations, broadcasts or whatever on modern equipments as IC7300. This filter is fully designed and manufactured in our company in Calderara di Reno (BO). Elliptical filter with 7 cells, low pass 0-74MHz. Brass cells separator manufactured especially for this filter. 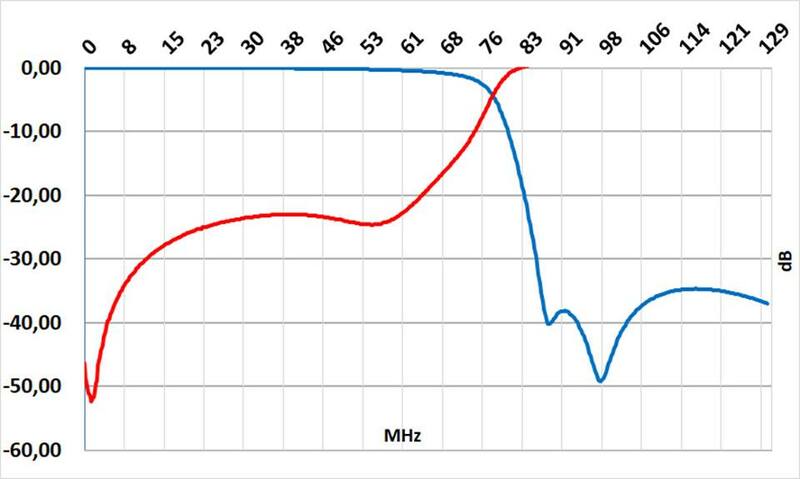 Each cell shielding allows great performances as the possibility to transmit up to 74 MHz and to have at the same time a strong attenuation at 88 MHz of 40 dB(at 98 MHz of 50dB, see graph below). It also allows to cancel FM residuals through all the HF spectrum up to 74 MHz..
Low pass filter with female/female SO239 connector. You can connect the filter directly between radio and antenna and use it in power with 100 watt. It’s ideal to break down FM residuals on HF (50 MHz and 70 MHz) frequencies for last generation radios like ICOM 7300 and similar. Low drop in reception up to 74 MHz. Ideale per abbattere i residui di FM sulle frequeze HF, 50MHz e 70MHz sulle radio di ultima geneazione come ICOM 7300 o similari. Brass cells separator has been designed especially for this filter. 40dB attenuation at 88 MHz, 50 dB attenuation at 98 MHz. You can transmit up to 74 MHz with 100 W.
Cylinder shape structure anticorodal (6000 alloy) aluminum made. Perdite quasi inesistenti da 0 a 74MHz.